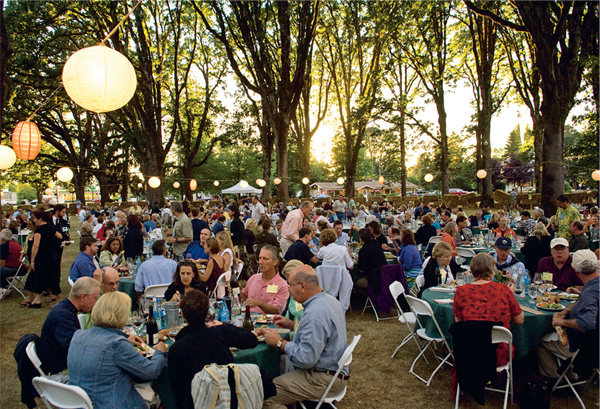 Gourmet food, sensational wines and the chance to mingle with winemakers – Fiona Beckett is in heaven at Oregon’s International Pinot Noir Celebration. Read the Oregon travel guide, including the best vineyards to visit, plus top places to stay, eat, shop and relax. Published in the Decanter March 2011 issue. I’m sitting in the middle of a huge grassy lawn drinking Pinot Noir – with 600 people around me. It’s like the ultimate alfresco dinner party with a phalanx of glasses on every table. Our sommelier Mary, who hails from Los Angeles, brings a bottle, then another, and another. Winemakers wander past to pour a treasured vintage. You carelessly dump what’s in your glass to try the next – a wanton waste, but how can you miss out? Welcome to the mad, hedonistic world of the International Pinot Noir Celebration, or IPNC as it’s called for short. I’d been meaning to go for years, and I wasn’t disappointed. It was more spectacular than I could have imagined – and quite bizarre to see people who had splashed out $1,000 (£630) for a weekend patiently queuing up for the chance to be doled out a mere sip of some treasured bottle. The organisation is formidable. To make things manageable, the attendees are divided into two groups. One group is further split up and sent on ‘mystery tours’ to various local winemakers, while the other group attends a seminar. Our group was dispatched to Belle Pente, founded by former home brewers Jill and Brian O’Donnell in 1994 and farmed organically and biodynamically. 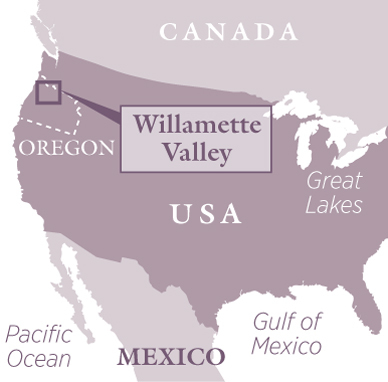 As Brian took us on a tour through the vineyards, with their stunning views over the Willamette Valley, I wondered what amateur enthusiasts were making of their discussions about rootstock and clones. But one of the great draws of this unique event is the chance for wine lovers to mingle with professionals. Back at the winery we had a go at creating our own blend from three different barrels – a far more difficult task than it sounds. I craftily managed to place myself next to Russ Rosner, the winemaker from Sokol Blosser (see box, right) but even with his advice, struggled to create a balanced wine. Each table then pooled its findings to come up with the perfect blend. Fascinatingly, we all came up with very different wines. I found ours voluptuous and rich in the glass but when I came to judge it at the end, along with sommelier Cyril Frechier of Seattle’s Campagne, it seemed way too oaky. In the end we voted for the blend created by Brian himself – I guess he should know his barrels. It was a humbling experience. I think I’ll stick to writing about wine. Next came probably the best meal of the whole weekend – and that’s saying something. It was created by Ben Bettinger, a young chef from Portland restaurant Beaker & Flask. One of the charms of IPNC is that it showcases homegrown chefs and local produce, such as the corn bisque and Oregon shrimp salad that Bettinger served; a perfect match for the 2007 Belle Pente Chardonnay. The next day the seminar was on food and wine pairing (it changes every year). Led by irrepressible wine educator Evan Goldstein, it featured four wines: Domaine de l’Arlot, Clos des Fôrets, Nuits-St- Georges 1er Cru 2004 from Burgundy; Pegasus Bay, Prima Donna Pinot Noir 2006 from Waipara in New Zealand; Dutton-Goldfield, Freestone Hill 2007 from Russian River Valley in California; and St Innocent, Momtazi Pinot Noir 2007 from Oregon’s Willamette Valley. First the winemakers talked about the wines, then the chefs explained the thinking behind the dishes they’d created to go with them. As is the way of these experiments, people come to different conclusions but what I found interesting was that the age of the wines influenced the match just as much as their origin. The standout pairing was the vibrant Pegasus Bay with a dish of rare loin of lamb with a plum and preserved lemon relish – a style of cooking that defeated the older, more delicate Burgundy, which went much better with a traditional dish of braised lamb shank and beans. At the end of each day there were open tastings, where Pinot makers from all over the world – from Patagonia to Burgundy – showed a couple of bottles from their range. Even in that illustrious company the Oregon wines shone. No wonder the French wandered round looking vaguely disconsolate. The weekend culminates in the famous salmon bake, where whole sides of salmon are strapped to alder wood stakes and grilled over charcoal – another perfect Pinot pairing. Collectors bring their own high-end wines to share, others pile into the ‘mosh pit’ on the slim chance they can get to try one. By the end of the evening I’m afraid we wimp out, heading gratefully for the beer and cider tent and finishing, like true Brits, with a cup of tea. Looking back, this exhilarating and heady experience is not just a must for any Pinot lover, but a must for any wine lover. It’s also a great excuse (if one were needed) to spend a couple more days in Oregon, which has some of the most appealingly bucolic landscapes of any wine region I’ve been to. But do it after rather than before the event. Trust me, you’ll need the rest. By plane: There are no non-stop flights to Portland, Oregon from the UK, but you can go via major US hubs like San Francisco, Chicago, New York or Los Angeles. Minimum flight time: (including layovers) is about 12 hours, then it’s about an hour’s drive to the vineyards.